The F1500 cabinet is manufactured using same material as the F2000 to achieve the best acoustical performances. the exterior is covered with blue prepainted steel. The interior is made of perforated zinc plated steel panels two (2) access panels are provided to ease telephone and electrical wiring. The lighting system consist of a fluorescent tube (18") covered by a removable dome. A stainless steel shelf allows the use of a residential type phone and a concealed bracket make it possible to mount a payphone. The cabinet F1500 has an hexagonal shape. One out of three (3) possible sides may be used to wall mount the cabinet and position the opening away from noise source. Thus maximizing the acoustical performance. 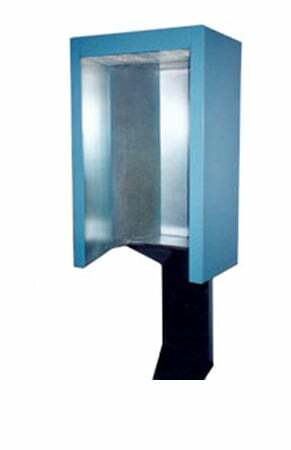 available options : pedestal mounted or special wall bracket for specific locations.